Nothing new covered, pound it out. Good results. Dog came along for Megawade just to remind myself why I don't always do this. Her fur picks up every bur in the woods, but ever so faithful to master's pocket of sausages. Usually after a mile of river rock she starts looking at me like we should turn back. I get a guilty feeling for a moment. Water was ice cold Saturday, sun was really shy. Wendy probably had no idea the adventure she was in for. She likes to lead, while not helpful for catching the ever spooky smallmouth, early the scaled rascals were not interested. That's OK, we were just moving and trying to stay warm. In anything but really deep water, you could make out quite a bit. At one such point, a wide bedrock plain with chipped out rock piled to one side and shallow ledge to the other, there was a large school of redhorse. The slightest footstep would send them scurrying. I reigned Wennister with bit off meat piece. A 'stay' and she held her ground well. Several periphery casts revealed a revulsion of all schooled fish. Slightly upstream a good size smallmouth sat waiting for food. It had spooked when Wendy and I first arrived. Test reactions. The bass moved away from any lure or noise and returned to the school several times. On the third or fourth repetition of this I spotted other black tail fringed fish. Larger still. They showed downstream spookabilty from my lures. Clear they probably saw me. I gave up the experiment, the dumb bass had returned to the fore again. Hungry, also aware danger was near. Wendy grew impatient and headed upstream. A second large smallmouth began to retreat down to the suckers, but then turned back. We stood still in the shade as the fish took up feeding positions several times, repositioning several times. Maybe to get a better look at me, or perhaps keep sun out of its eyes. After about the 10 cross court topwater presentation the fish slowly advanced the 8' to my lure and took it, some 8-10' in front of me. Guess it didn't notice me so well after all. 18"
Thought about waiting on the hole and watching the other 4-5 really nice bass move up and repeat. Could be all day or never. We had a long journey. Fishing did pick up. Wendy and I are fishing along when I hear noises in the woods. Surprised, a dude in fly gear decides he's going to come late and then cut in front. He went up one channel, never looking back. No way he didn't hear us. I didn't' travel all this way to have someone jump in front on spooky water halfway into a wade. He was power walking through water where I normally catch decent smallmouth. For a quarter mile we took the left channel as he took the right. Skipped back in front and slammed on the brakes. Unfortunately, a third of the fish on this wade are usually in that 1/4 mile. He followed behind eventually wading in water he should have been fishing and turning back. Could have saved himself the trouble when he saw us at the bridge to find another section. 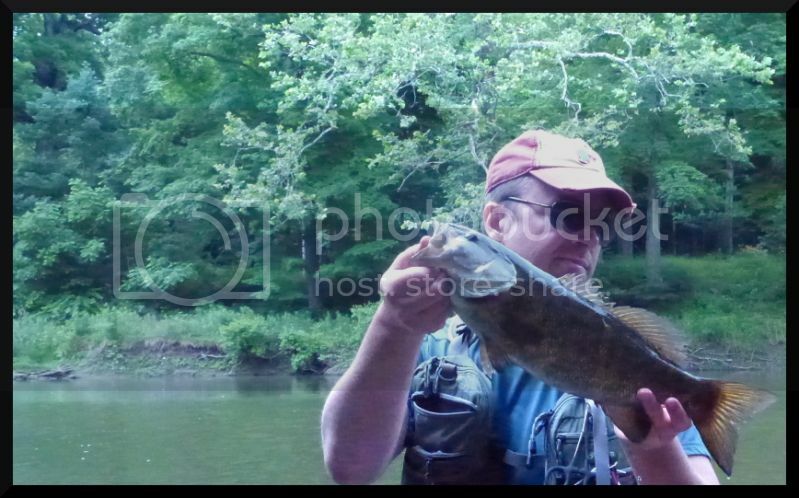 Smallmouth weren't evenly spread out, when I got into some they were often in bunches. Finally at the large end pool, Wendy and I are in waist deep water, she swimming comically in circles. Had just landed a 12"er, next throw of some 30 yards lands with a nice hop and following explosion. 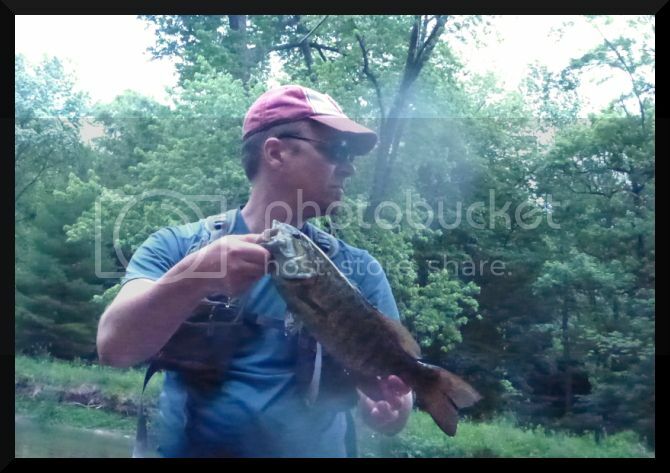 One of the longest fights and most powerful smallmouth in a while. She was in charge. The fight may have lasted a minute or so. Directing the swimming dog away from hooked bass was hilarious. She would turn the wrong direction and I'd have to convince the bass she was not a tree. Finally reached shore and it was a nice one 19.5". Not much further, 17.5"er and another swimming dog/fish fight. We got off the water and biked back to the car. Worn. Out. Dog. Sunday- debut of Platypus 3l water bladder. Doesn't quite fit in the pack. 85-90oz/101oz capacity will fit and stuff in the back pack. Improvement. I stayed pretty well hydrated in a 7 hour wade. Went for afternoon this time. River traffic was out. Bikini hatch canoe, 4 yakers/fishermen, then later 2 more fishermen, barking dog and waders. Nice fun . Hope this doesn't get like Kentucky. Fishing wasn't knock 'em out, but consistent. 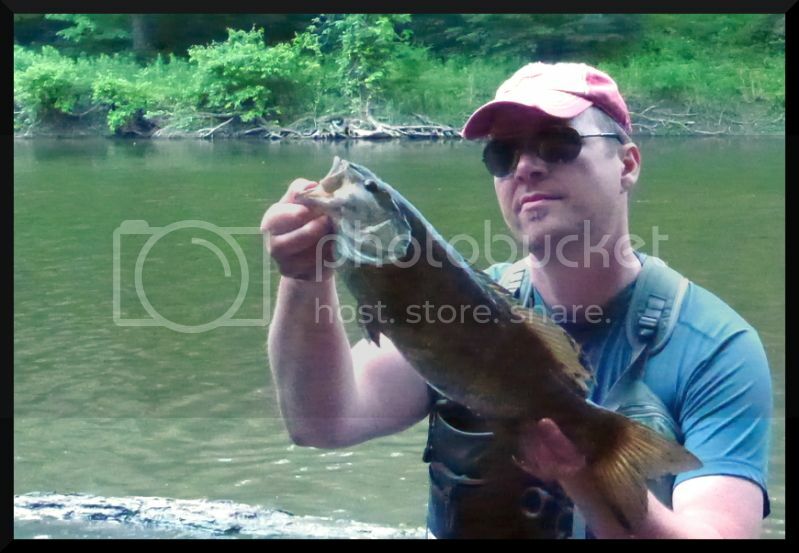 Nothing big, 5 smallmouth 16.5"-16.99", several feisty 15"'s, lots of black fry strewn all over starting to act like they have brains. Still easy to step on if you aren't looking. Easy, easy to see if you look.